Is There a Silver Lining for the Medical Device Coatings Market? Medical device coatings are essential to healthcare. Up to 80% of medical devices require at least one type of coating material or surface treatment. Coatings that enhance biocompatibility have improved the quality of implanted electronic devices and artificial joints. Catheters and examining room surfaces with antimicrobial coatings have become frontline defenses against antibiotic-resistant infections such as MRSA. Between 2016 and 2021, BCC Research anticipates that growth rates of medical device coatings will be further reduced by factors both within and well beyond the healthcare industry. The following are some of those factors. Medical practice consolidation. Between 2009 and 2016, the number of US medical practices with five or fewer physicians decreased from 47% to 38%, according to industry sources. The consolidation of solo practitioners and small groups into regional and hospital-based healthcare delivery settings has significantly reduced the need for new and replacement devices. Fewer candidates for joint replacements. The announced elimination of the Affordable Care Act in the United States is poised to defer demand for some of the most profitable medical devices: orthopedic implants. Improved device longevity will depress equipment purchases. In all developed nations, medical device purchasers are showing an increased preference for equipment that can be kept in service longer. Basic versus specialized care. In regions defined in BCC Research’s study as “rest of the world,” there has been a reallocation of healthcare funding to meet the most basic medical needs, at the expense of adding more specialized equipment. IS A MATURE INDUSTRY AT THE MERCY OF HEALTHCARE REGULATION? As coated medical devices have become increasingly used for the treatment of diseases and injuries, the industry finds itself drawn further into the realm of healthcare regulation, which, like the device industry, has become a highly internationalized business. 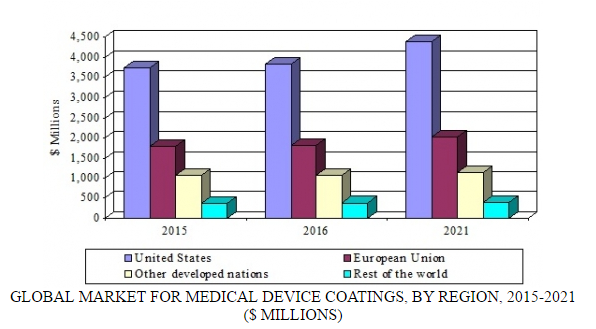 BCC Research forecasts that the combined impacts of the maturation of coating technology and the factors described above will constrain the demand for medical device coatings and surface treatments. BCC Research’s study, Medical Device Coatings: Global Markets, forecasts that the global market for medical device coatings and surface treatments will register a 2.2% compound annual growth rate between 2016 and 2021, with global demand reaching $7.9 billion in 2021, up from $7.1 billion in 2016. CAN A SILVER BULLET REINVIGORATE AN AILING MARKET? Concentrations of silver that are far below levels harmful to humans can kill or limit growth of a broad range of bacteria, pathogens, fungi, and yeasts. The infection-fighting capability of silver has been known since antiquity. Early in the 20th century, compounds containing silver in an ionic state were commonly sold as antimicrobial agents. Silver-bearing compounds, chiefly silver oxide, remained popular until the commercialization of antibiotics midcentury. Today, the antimicrobial action of silver ions is well understood and has found application in coatings that can prevent the spread of disease-causing bacteria in clinical environments. Coatings impregnated with silver and applied to catheters and other patient-contact surfaces have emerged as a useful tool in combating hospital-related bacterial infections, which, according to the Centers for Disease Control and Prevention, add $4.8 billion per year to US hospital costs alone. There has been a resurgence of interest in the use of silver ion–releasing coatings as a frontline defense against hospital-acquired infections, an increasingly critical and expensive problem for hospitals as pathogens become more resistant to antibiotics. Loboa and her colleagues set out to determine the efficacy of coating stem cell–seeded scaffolds with silver ions. The scaffolds were created from a polymer called polylactic acid, which is an FDA-approved material that eventually biodegrades in the body. Next, researchers applied a silver ion–releasing coating to the scaffolds and seeded them with fat-derived adult stem cells that could be triggered to create bone cells. They also seeded the scaffolds with MRSA so that they could observe whether the silver ions could fight the bacteria. The scientists found that the silver ion–releasing scaffolds not only inhibited MRSA, but also supported bone tissue formation.